Finding a comfortable pair of shoes is something that doesn't seem to come naturally to me. The evidence for this lies in the numerous amount of times that I've hobbled in agony from A to B, past caring whether it's socially acceptable to remove your footwear in public and with various painful blisters and cuts that I still have scars from years later. 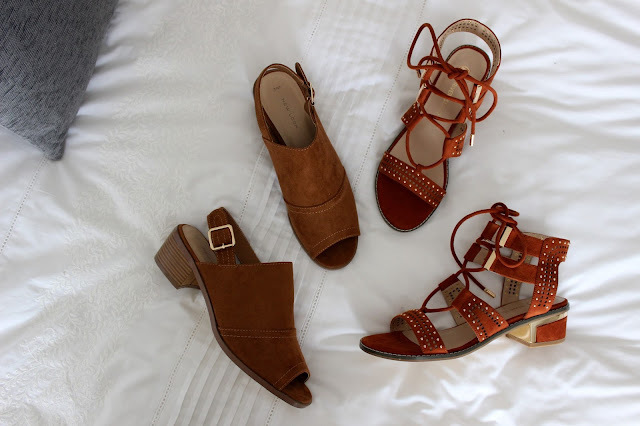 Enter two pairs of extremely cute sandals that I feel I've thoroughly tried and tested (e.g. stomped around London in during a heatwave on more than ten occasions) and been pleasantly surprised. I didn't have to stuff tissues between any straps, and there's something about tan sandals in summer that I just think looks so fresh and gorgeous. The first pair are from River Island and are the Tan Block Heel Sandals. I originally bought these in black and wore them so much that I couldn't not snap them up in this stunning burnt orange shade also. Everything from the lace-up front to the gold stud detailing floats my boat and I seriously cannot stress how comfy there - plus, they're currently half price in the sale at £20. If you can't find your size, I've found some really similar pairs from Boohoo, New Look, Oasis, Park Lane and Eeight. Another £20 pair of tan heels that I've been loving are the New Look Open Toe Faux Suede Sandals as I've been looking for something like this for such a long time; well-made mule-style slingbacks with a sturdy heel and a peep toe that are perfect for everyday wear, especially when paired with blue ankle-grazer jeans. They're true to size (I went down a size with the River Island pair for the perfect fit) and the simple design is a total winner. I'm not sure I could be happier with these two purchases if I'm honest. They don't break the bank (or pinch your little toes!) and they're beautiful. Get 'em in your life pronto!